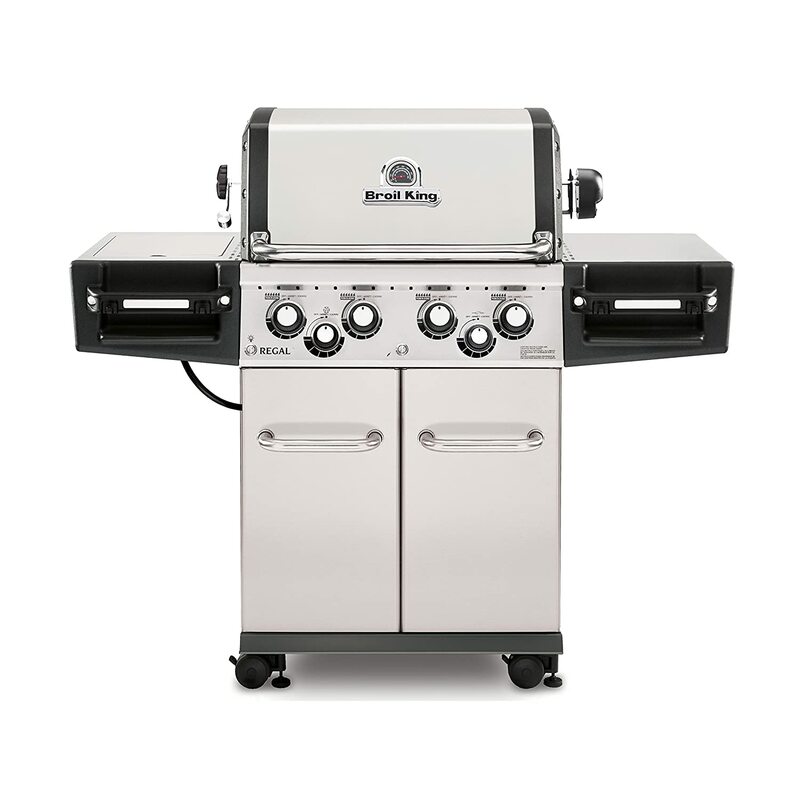 4-burner gas grills are easy to find however because of the excessive varieties and models, customers often get confused and end up buying the wrong one that doesn’t suit their requirements or just a poor quality overall. Below we have picked some of the best 4-burner gas grills and done a very comprehensive review on them. This according us are some of the top gas grills in the market as they come with a wide range of features and benefits that improve the grilling experience. Some of these grills are top-of the line for the specific brands which means they come with more features and better qualities compared to other grills. Now, if you’re looking for the most popular and best selling 4-Burner gas grill, Then I’d say you found it. This one has over 1500 reviews on Amazon currently. Probably the the season that this grill is so popular is because of its price. It is perhaps one of the cheapest if not the cheapest 4- burner grill in the market currently and you can find it even retailing at under $300 depending on the shop. At that price for a 4-burner gas grill, its not hard to see why it’s preferred, and customers seem to find value for the price too because it is also one of the best rated on Amazon currently. However when you compare its features with the grills on this list, then this one falls at the very bottom. It only made to this list because of it popularity. 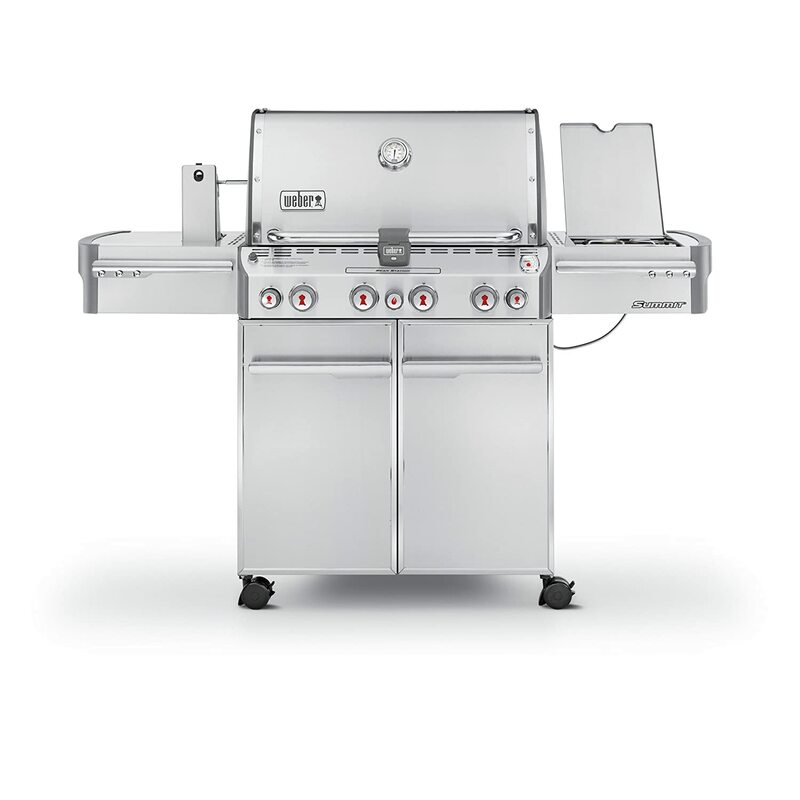 It is a 40,000 BTU gas grill with 10,000 BTU lidded side burner that provides an extra cooking area for side dishes. It is powered by an Electronic Igniter. When not in use the lid can be flipped down to offer an additional work space. Features 480 square inches of primary cooking on porcelain-coated cast iron grates plus another 180 square inches of secondary cooking on porcelain-coated swing away warming rack. That makes a total of 660 square inches of total cooking area. The lid, handle and control panel are made of stainless steel. Has a temperature gauge that allows you to monitor the inside temperature of the grill. 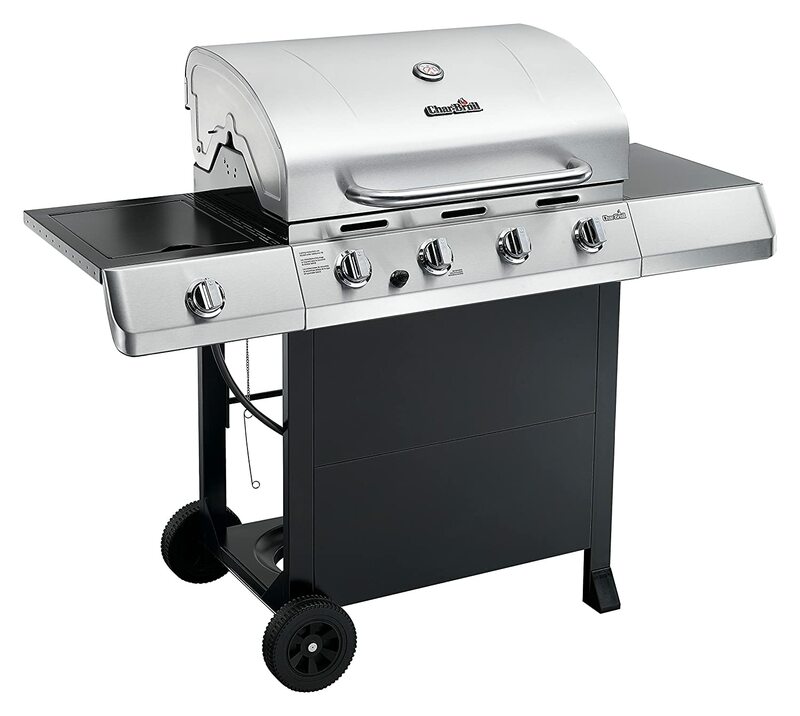 Inexpensive gas grill, probably the cheapest 4-burner gas grill available. “An excellent buy for the money” one reviewer said. It is probably worth the money because it will end up lasting a few years. Side burners have a low heat output. Unlike the other 4-burner gas grills on this list, this grill may have problems with heat distribution and even heating. Some reviews mention that the quality of stainless steel used in construction is poor. No convenient features like reduced flare ups, night lights for night cooking, propane gauges and other features that make grilling a breeze and a worry free experience. Five-year warranty on the steel burners and one-year parts warranty. This when compared with all the grills in this list is way too short. Weber grills are one of the leading brands and most popular in the market today as evidenced with the reviews and ratings on Amazon. This particular grill is the “crown jewels of the Weber family”, with its excellent yet practical features and its high performance levels of performance that make grilling a breeze! The cook box is made of durable and efficient cast aluminum which when combined with the shroud, allows for the efficient distribution of heat for even cooking of food. The cooking grates are crafted from durable and easy to clean quality 9mm stainless steel which retains heat evenly and sears food nicely. Burners are made of a singular piece high-grade stainless steel that is durable and resistant to rust. The Weber Summit S-470 Gas Grill features the stainless steel Flavorizer bar system that reduced flare ups and adds flavor to your food. It catches any food drippings. The drippings are vaporized and the smoke is absorbed back into your food adding that delicious flavor to your food. If any drippings are not vaporized, they follow the slope of the unique angle of the Flavorizer bars and flow away from the burner tubes, down into the grease management system. This also protects the burner tubes from becoming clogged. Integrated tilt sensor on the handle that lights automatically illuminating your grill for easy night time cooking. The grease management system features an angled grease tray that sits beneath the cook box and catch pan. The drippings are funneled down the grease tray and into the catch pan. Once the catch pan starts to fill, disposable catch pan is removed and replaced with a clean pan which is done by simply sliding out the grease tray. Comes with a LED propane tank scale that lets you know exactly how much fuel you have left at all times. The front-mounted lighted control panel comes with four stainless-steel burners that produce 48,800 BTUs and a 10,600 BTU sear Station, each with Snap-Jet individual burner ignition for fast and reliable lighting. Features a flush-mounted 12,000-BTU side burner, a 6,800 smoker burner, and a Tuck-Away 10,600 infrared rotisserie rear complete with a flip-up motor and separate spit and fork storage. Comes with a stainless-steel shroud with a built-in thermometer to monitor cooking temperatures. The enclosed storage area keeps your propane tank hidden. Offers a durable cooking system with several convenient features including more shelving space to the grill cart when the side burner’s lid is shut, additional prepping space by the side burners and the six built-in tool hooks. Additional cooking area with a rear burner rotisserie kit with 10,600 BTU output, a 10,600 BTU searing station for that additional high heat, and a wood chip smoker box with a 6,800 BTU dedicated burner. 10 year warranty on the grill body and the burners. It is not an all-stainless steel grill therefore not as durable as other all-stainless steel grills in the price range. This American made gas grill guarantees quality and provides you with the best that is out there. The stainless steel grates don’t require a lot of maintenance and come with heat retention. The lit up control knobs add a stylish appeal to the grill. The coolest feature is the Flav-R-Wave stainless steel cooking that adds so much more flavor to your food. 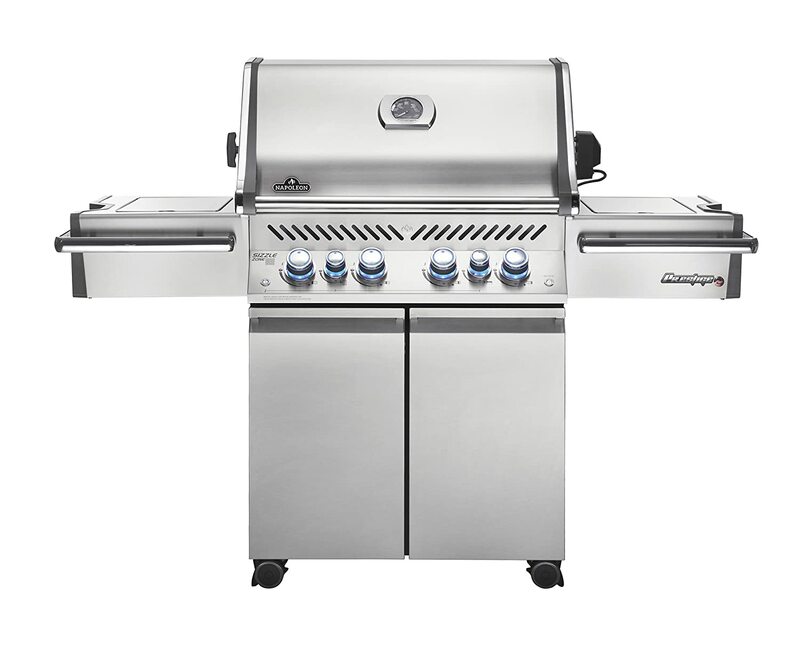 The 4 Dual-Tube burners of the Broil King Regal S490 Pro 4-Burner Gas Grill are made of high quality heavy duty stainless steel and generate up to 50,000 BTUs. The cook box is made from die-cast aluminum and high-grade stainless steel to ensure durability and top notch heat retention and even heating. The cooking grids are also made of quality 9mm heavy gauge stainless steel rod this is to ensure longevity and excellent heat retention. The grids are easy to use and cleaning is just as easy. Comes with a stainless steel cooking system for excellent heat distribution across the entire surface of the grill. The stainless steel cooking system also serves to protects the burners. Broil King Regal S490 Pro 4-Burner Gas Grill comes with linear-Flow valves with 180º Sens-Touch control knobs for heat control. Features a side burner with a 10,000 BTU output. Also comes with a 15,000 BTU stainless steel rotisserie burner complete with a premium spit rod and motor. One another convenient feature is the pull-out tank drawer for the propane tank. This will ensure the tank replacements are fast and easy. The Flav-R-Wave feature on the stainless steel cooking system vaporizes drippings. The vapors are absorbed back into your food for that distinctive barbecue flavor. The design of this grill is such that the components are designed with emphasis on excellent heat retention and heat distribution. This will ensure your food is cook perfectly and evenly with no cold or hot spots on the cooking grid. The Dual Tube design creates an efficient two-row of flame. Thanks to the high BTU the Broil King Regal S490 Pro 4-Burner Gas Grill generates robust flames and high heat output. Side burner and rotisserie provide flexibility in cooking as you can create side dishes and slow roasting while you grill. This grill is guaranteed to last given the quality and heavy-duty nature of components. While this grill comes with a limited lifetime warranty on the cook box, the warranty on the remaining grill components is lower than many other grill manufacturers in the market. This another gas grill that guarantees quality and years of use. It is has the highest BTU output on this list as well as the largest grilling surface. Constructed from one of the thickest steel in the grill industry, it is made of durable high quality 14 gauge 304 stainless steel. Four BTU burners each with an output of 15,000 BTU,with an additional 15,000 BTU infrared rotisserie rear burner chrome plated spit and rod to enhance your cooking options. The heavy duty thermometer will help keep track of your food’s temperatures at all times. Even heat distribution on your grill by with the help of the flame tamers that create a more even grilling surface, eliminating hot and cold spots allowing you to use the entire grilling surface. Comes with built-in lights for night grilling night. Also comes with 2 side shelves for your BBQ tools and accessories. Includes a full size easy to clean removable grease tray. One of the highest quality grills and you can be assured of durability. Cast stainless steel burners are warranted for twenty (20) years. The stainless steel cooking grids, stainless steel frames, and housings have a lifetime warranty. Their stainless steel flame tamers come with a warranty of three (3) years. All other components come with a warranty of one (1) year. Looking for a sear to compare the steakhouse quality? Look no more, the ceramic infrared burner that comes with the Napoleon Prestige Pro 500 Gas Grill will help you achieve the desired results. Also, it comes with innovative accessories and integrated functionality that you may not find in most grills that will be discussed below. The Napoleon Prestige Pro 500 Gas Grill comes with an infrared rear burner, rotisserie sizzle zone side burner. Dual-Level stainless steel sear plates for heat distribution and also help to vaporize the drippings that are absorbed back into your food for delicious flavors. This reduces flare-ups not to mention protect the burners. Stainless steel cooking system with heavy-gauge tube burners that are lit by a Jetfire electronic ignition which is designed to safely and reliably light the burners. The control knobs featuring night light and two interior halogen lights will be very helpful for illuminating during the late night grilling sessions. Stainless steel grates feature a trademarked wave design that creates unique sear marks on the food. Stainless steel side shelves include an ice bucket/marinade, condiment racks, towel holders and integrated cutting board. Comes with integrated storage shelves in the cabinet that are illuminated with interior lights. There is also a bottle opener in the cabinet. Comes with a built in smoker tray that allows you to use the grill as a smoker. Premium marine-grade 304-stainless steel construction which means it will last for years. Unrivaled its storage features. It comes complete with soft close storage doors, built-in shelves in the cabinet, condiment racks, towel bars, tool hooks and even a bottle opener with cap catcher. Super convenient ! Backed by a strong warranty, one of the best in the market. Napoleon Prestige Pro 500 Gas Grill comes with a lifetime warranty on the exterior housing, cooking grids, and stainless steel cooking box. Also has a 10 year + 5 warranty on the burners. Reduced flare-up thanks to the sear plates that instantly vaporize the drippings. Can be used as a smoker by adding soaked wood chips to a stainless steel smoker tube. Can also be used as a charcoal grill by replacing the sear plates with charcoal tray. 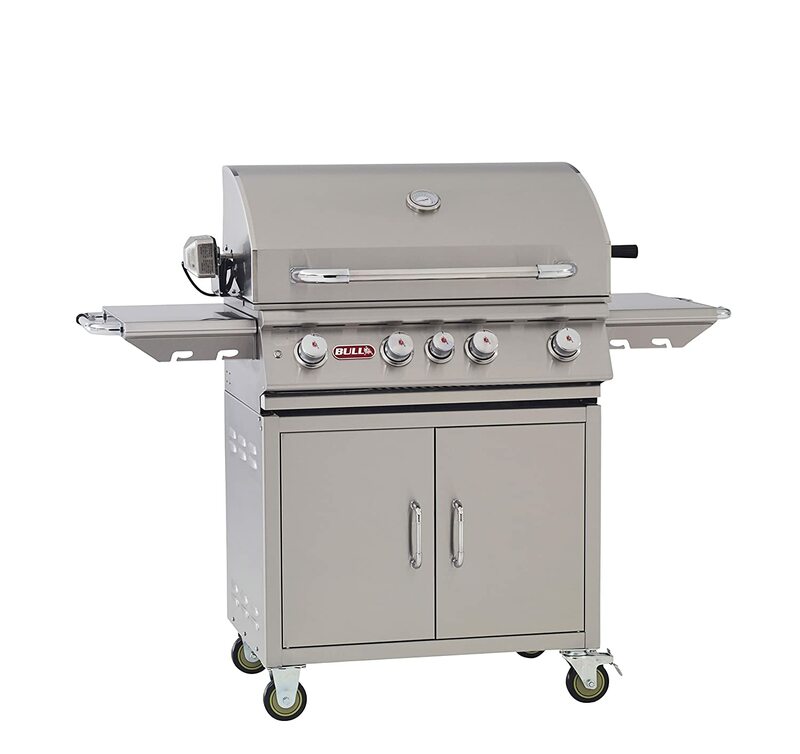 Napoleon Prestige Pro 500 Gas Grill is made of all stainless steel, which is what is preferred in terms of durability. It has cast aluminum and porcelain enameled steel on components such as the cart legs and back panels. There are plenty of grill options available in the market to choose from. However, before you make a decision it is important that you consider few things. First thing that should be your priority is your price range, gas grills range from $150 to as high as $7000 and even more. So, you need to set your budget first. Once you have the budget down, you can choose a gas grill easily. You might ask what size has to do with a gas grill, right. Depending on your usage, the size of the gas grill may vary. Of course, grills vary is sizes from the number of burners, the grid cooking are to the additional cooking area. You need to ask yourself, how many people do you usually cook for and what type of food you would be regularly. You also need to consider your kitchen space so you don’t over stuff it. Gas grills come in different materials such as aluminum, cast iron and the most preferred, stainless steel. Stainless steel is more durable but that also depends on the grade as it comes in different grades; 203, 304 and 430. When the temperature rises, the grates’ material starts chipping off into the food. So it is important that you keep the quality of the grates in check. The best ones to go after are the heavy cast iron grates or heavy gauge steel as they are durable and do a pretty good job at distributing the heat evenly. Most grills come with a wide range of convenient features i.e. side burners, sear burners, smokers, infrared technology and baffle systems, storage racks, tool holders etc. So, before you buy, shop around for the various features and see which will best suit your needs. So if you’re looking for a 4-burner gas grill, then look at our top picks and compare them with the others in the market.